Happy November friends! Now that Halloween is behind us, it's time to get into the holiday mode. In just three short weeks, my favorite holiday will be here, so it's time to start thinking about chunky knits and stylish, yet comfortable, outfits you can wear while stuffing your face! Speaking of chunky knits, how cute is this open knit cardigan? Not only do I love the burnt orange color for the fall, but it has a thin shawl collar and pockets, which both add fun detailing. The sleeves are three quarters length, making it a perfect cardigan to throw on during a warmer fall day. However it's been cooling off here in New England (were talking only 40 degrees in the mornings), so I've been wearing it layered over long sleeve tops. I decided that I wanted to mix the burnt orange with grey, and chose my thumb hole tee. Does anyone else have a love/hate relationship with thumb holes? I love the way they look, and the warmth they provide, yet I hate having to take my thumbs out every five minutes to wash my hands or clean up the kids. However, I can't stop buying them! I finished my look with my favorite grey booties, and threw on a plaid blanket scarf for extra coziness. I love how the colors looked paired together for a late fall look. The feature blogger is Jessica of NotJessFashion. I'm loving how she styled her plaid pants with a chunky knit for a cozy fall look. Make sure to stop by her blog to see tips for styling plaid, and say hello! Loving the layers in this look, so stylish! That's a great cardigan. I am looking for a brownish cardigan for so long, this one is beautiful! Love this color combo. SO perfect for fall. I have a similar scarf and wear it all the time. Perfect Fall look! Your sweater and blanket scarf look so cozy! It is a cute sweater. I love your booties and scarf too! Love this color and pattern on the scarf. And that cardi is gorgeous! Looks so cozy! Love the cardi and scarf! The colors look perfect together! Rachael, so, so cute! You look adorable and so cozy. I love everything about this look! Those boots are gorgeous. Love the color of this cardigan! This whole look is perfect for fall! I think this is one of my favorite looks you've worn! I love the layering and it's totally something I would wear! Thanks for the linkup! Now I want more of that mustard colors in my closet!! I am just loving this shade of yellow, it goes so great with that scarf and I love the long sleeves with the chunky cardi. So pretty! Love this look! It screams fall! You look gorgeous! Such a perfect fall look! I am in love with this mustard cardigan paired with the scarf! The pics looks so cool! love the scarf!! Lovely layers dear! Love the play of colors. That plaid scarf is such a fab and functional accessory indeed. Chunky knits and scarves are my favorite! Love the burnt orange color on you, too. You are giving me ALL the fall inspo! Loving that scarf! Love that sweater! The color is so pretty and it looks sooo cozy. The warm, autumn color combination in this outfit is stealing my heart. That chunky open knit is so cute and the scarf looks oh-so cozy on you! I love how you styled this look! So perfectly fall! Such a cute Fall look!! I am loving this knit cardi and this color combo!! This outfit screams fall!! Obsessed with it all! There's nothing I love more than fall colors and your outfit perfectly captures that! Love it!! 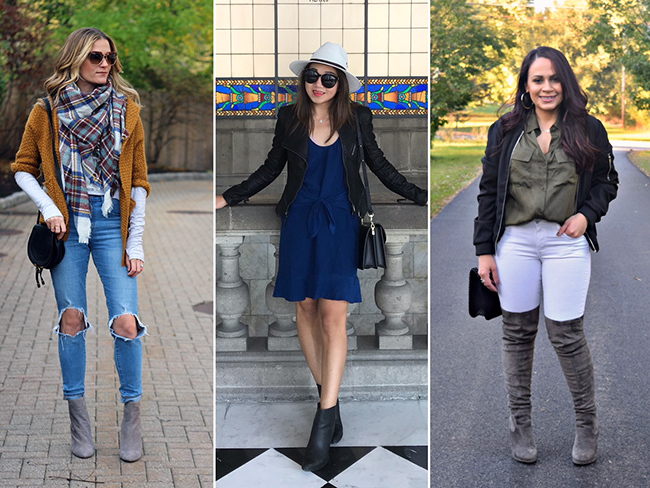 Love your casual fall outfit! That cardigan is so cute! Your cardigan is so cute! I absolutely love how the vibrant color of it pairs with your patterned scarf. I could definitely see myself wearing this. I have a coat of this color and just adore it, you look so cute! What a great scarf - and I am loving the layering with the chunky knit! Loving everything about this outfit girl!